To nurture lawn without waste, ensure that you know when—and how much—to water. Q: I notice neighbors’ sprinklers running at all hours of the day. What’s the best time to water grass—and how much is enough? A: With many communities experiencing drought in recent years, it’s more important than ever to heed common-sense guidelines when watering our lawns. Doing so correctly can save resources while keeping you out of hot water with your homeowner’s association and even your city. In areas where HOAs and municipalities enforce strict rules, wise watering can save you from fines as well. Early in the morning is the best time to water grass. At sunrise, when everything is cooler, you’ll get the best water absorption. 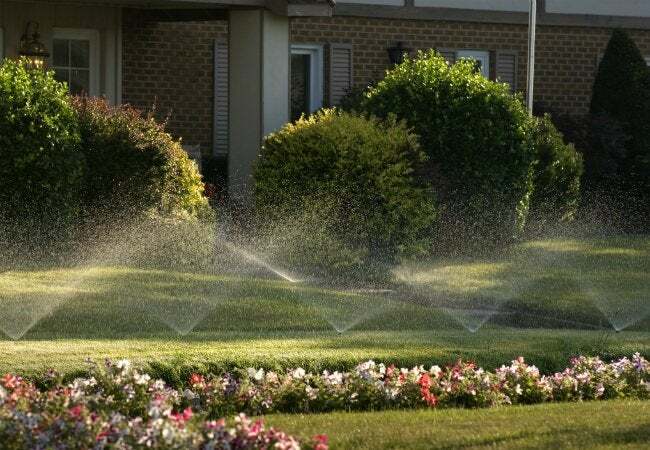 If you water later in the day—particularly if it’s bright, warm, and breezy—the heat of the sun and force of the wind can rob your grass and other plantings of precious hydration. If you get the job done at dawn, you’re giving the water a greater chance of reaching the roots and being fully utilized. So set those sprinklers accordingly. How much water you use is also critical. It may seem smart to set your sprinkler or irrigation system to the highest setting and drench the area as rapidly as possible, but if you water too quickly, you may experience runoff. This robs the lawn of ample absorption and wastes water in the process. So keep an eye on the edge of your lawn to make sure you’re not literally letting precious water run down the drain when it could be helping your grass grow. Follow the rule of one inch of water every week, divided into two or three sessions. More than that can drown your grass, depleting it of oxygen and causing it to die, so measure your output and wait about three days between each watering session to give it a chance to breathe. To ensure you’re hitting the mark, place a few coffee mugs around your yard and test the sprinkler system to see how long it takes to fill each cup to the 1/3- or 1/2-inch mark. Then, set the system for that same amount of time every three days or so. 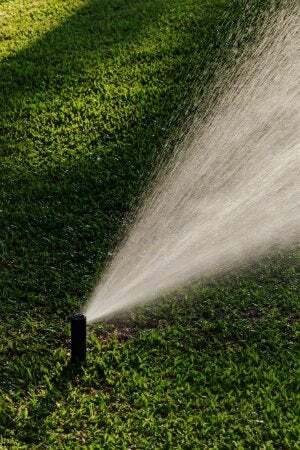 Watering daily is almost always too frequent, while once a week is rarely enough. So aim down the middle and watch your lawn flourish. Keep an eye out for dryness. Grass that’s discolored or curled over at the top is likely suffering from a lack of moisture. The same is true of a lawn that still shows your footprints after you’ve trod a path across it, with the blades refusing to bounce back up. If you notice these signs of dryness, adjust your watering schedule to start earlier in the day and allow for slightly longer sessions, or perhaps fine-tune your watering days to occur a bit more frequently. Watch out for overwatering, too. If the ground feels particularly sponge-like and causes your feet to sink as you walk across the lawn, or if you see a thatch of extra vegetation taking hold of your topsoil when you run your hand over the blades, you’re watering too much. However, when modifying your frequency, don’t do so abruptly. Take a few weeks to slowly adjust your watering schedule to keep the shock of change from further damaging your lawn. To truly want to cut back on water consumption, consider xeriscaping or native landscaping. Xeriscaping involves landscaping that requires no or minimal watering, often using sand, pebbles, or mulch where grass would otherwise be found. Native landscaping involves grasses and plants that thrive naturally with typical local rainfall, reducing or eliminating the need for extra watering. Both are attractive and effective ways to cut back on your water bill, and some homeowners choose to combine the two for a beautiful, eco-friendly landscape that demands little upkeep. Whichever approach you choose, best of luck with your outdoor space this summer! Still have questions about lawn care? Watch and learn from this short video filled with easy-to-follow advice for anyone who wants their green grass to stay that way.